From what I understand of BB Creams, they are supposed to be a dual-purpose product – providing a variable amount of coverage to improve the appearance of your skin, but also providing skincare benefits. I’ve tried a fair few BB Creams since the phenomenon hit the Western world a couple of years ago, but so far I haven’t seen much evidence of skincare benefits in most Western BB Creams. I guess this is because they are all created by cosmetic brands rather than skincare brands. It’s high time that actual skincare brands started releasing them left, right and centre as I am convinced that these would be excellent products. 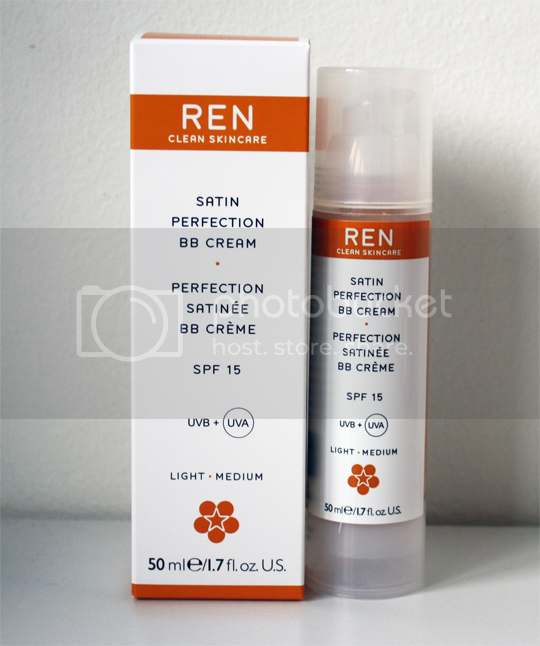 Enter REN Satin Perfection BB Cream*! Previously to this, the only REN product I had tried was the Glycolactic Radiance Renewal Mask and as I was suitably impressed with it, I couldn’t wait to put this BB Cream to the test. This is REN’s first ever foray into a coloured cosmetic, so it’s definitely exciting news – and one that I can see proving popular simply because REN is a brand which already has great skincare credentials. Unfortunately there is only the one shade at the moment (Light Medium) but there are plans in the pipeline to release new shades depending on the popularity of this one. Despite the fact that I’m very pale and this looks slightly dark in the tube, it actually suits me fairly well and I expect it could adapt to many lighter skintones. Let’s just keep our fingers crossed that more shades will be released before long for black and Asian skins. The first thing you’ll notice when you pump this out of the tube is the same glorious citrus scent found in the Glycolactic mask. This is thanks to the abundance of Vitamin C, which revitalise and boost the skin’s radiance. It doesn’t have quite as potent an effect in this area as the mask, but that’s to be expected. The BB Cream also claims to tone and firm the skin by boosting elastin production. It does this with the inclusion of Flurophores, which are a bio-extract from Noni juice. That meant absolutely nothing to me but a quick Google tells me this is obtained from the Morinda citrifolia tree, part of the coffee family, found in South East Asia and Australasia. I’ve only been using it for a couple of weeks so I can’t vouch for any long-term benefits. Speaking less about ingredients and more about appearance, I really like the finish of this. Its lightweight coverage is given by natural mineral pigments and the effect on the skin is quite matte, but without looking flat, dry or powdery which is a huge pet hate of mine. I find it controls oil quite well (which is a godsend for my T zone), and whilst it’s not a heavy coverage it evens out my skintone wonderfully. It also contains SPF15 with both UVA and UVB protection, another reason that this is going to be my go-to base in the Spring and Summer. As suggested, I’ve been applying this with my fingers rather than with a brush and it’s working really well. The packaging suggests gentle tapping to help it dry and I find this helps a lot with blending it perfectly, giving that illustrious second-skin effect that we’re always searching for. Here’s the bit everybody loves to hate; the before and after. As you can see, this really does blend perfectly into the skin and does a great job of evening the overall skintone and controlling oil. This gets huge raves from me, and I would definitely recommend picking it up when it’s released in May 2013. It’s actually great value too, at £26 for 50ml which is more product that you get with most bases. It will be available in the usual REN stockists – Selfridges, Space NK, Liberty, John Lewis, M&S Your Beauty and online. Will you be trying this out? What do you think of REN products in general? I’ve been so impressed by the two that I’ve tried, I’m just itching to try more! Any recommendations? Wow, this BB Cream looks damn near flawless. I’ve heard only good things about REN, so I do hope they’ll put out a shade that suits darker toned people so that I can get myself a tube. It is a really great product, just such a shame there’s only the one colour at the moment. I really, really hope they bring out some others! This sounds lovely and looks great on you. Will definitely be checking this out when I see it in M&S! Thank you! Definitely do – I think it’s the sort of thing that will work for pretty much anyone. I like it, but I am a bit unsure about all the citrus oils in there as they can be quite photosensitising, so they are not the best ingredients for a spf. I also find it a bit dark on me and the coverage is minimal. It is very lightweight so probably better for oilier skins. (I use a facial oil underneath and my skin still feels tight…). Not sure whether I will repurchase (i got mine from space nk).